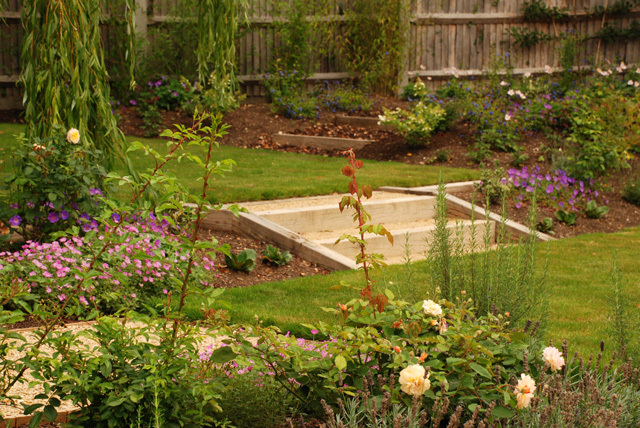 Sloped gardens can be a bit daunting to deal with, but they provide an easy way to make a garden more interesting because you can use what’s already there to your advantage. 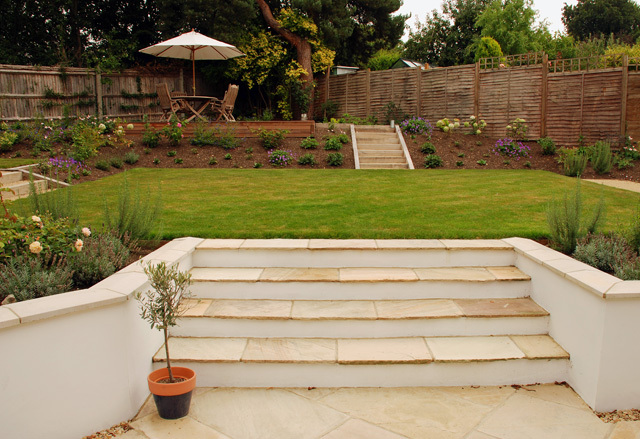 Of course flat gardens can be interesting too, but a naturally sloped space will present different opportunities that you might not otherwise have. The downside of a sloped site is that retaining structures cost money and sometimes it’s the foundations below ground that take up a significant portion of the budget. When you’re not going to see what’s below the ground it can be difficult to stomach spending a lot of money even when you know that the end result will be well worth every penny. I know I’d much rather spend money on a nice paving stone or bigger plants. But dealing with levels doesn’t have to be about expensive bricks and mortar, there are ways to keep the costs a bit more manageable. You may remember me blogging recently about a project in Leatherhead which was finished in the summer. The difference in height from one side of the garden to the other was 2 metres over a distance of around 19 metres. In order to fit everything in and make the garden more usable we needed to terrace the garden, but we didn’t have the budget to build lots of expensive retaining structures. 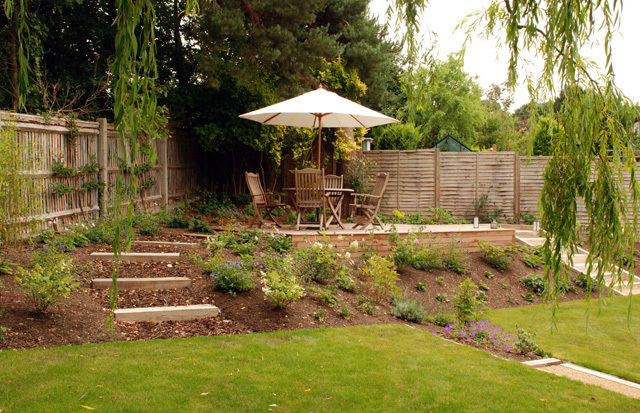 I wanted to keep the retaining structures as simple as possible by using timber sleepers rather than bricks and mortar and with some careful calculating we were able to incorporate sloped beds between each area. The steepest planting bed is below the decked area but it’s worked particularly well here because the full scope of the planting can be seen from the house and this is the main view. The soil was quite stable in this garden, but for lighter soils a neat way of keeping the soil from washing down is to bed sleepers into the slope. This creates a sort of stepped effect without terracing the planted area completely and will eventually be hidden by the plants anyway. I’ll definitely be using this method again. It’s more suited to less formal gardens, but I think you’ll agree that the finished result is pretty good and we managed to save a significant chunk of cash in the process. 7 metres is a big slope, no wonder you’re head’s in a spin. Let me know if I can be of help – where do you live? This is great, we have just recently moved into a home with a sloped garden. This have given me a bit more inspiration and hope after a few eye watering quotes for lots of retaining structures. Thanks . I’m glad it’s inspired you, Lisa. Sloped gardens are always interesting to work with.